To promote the publication of mathematical and theoretical papers in the Journals of the Union. Far from having exhausted its research potentiality, Mathematical and Theoretical Crystallography (MaThCryst) is today facing new challenges, not only in the very classical field of group theory (magnetic groups, chromatic groups, N-dimensional groups) and its applications (phase transitions, polymorphism and polytypism, twinning, bicrystallography, ferroic crystals), but also in several directions that previously were less strongly perceived as being directly related to crystallographic and crystal-chemistry problems, such as graph theory, combinatorial topology, number theory, discrete geometry, diffraction theory, etc. The development of mathematical and theoretical crystallography will strengthen the interaction between crystallographers, mathematicians and materials scientists and will definitely contribute to the recognition of crystallography as an interdisciplinary science. The outstanding success that applied crystallography has experienced in recent years has transformed common structural investigation into a routine task, often performed by researchers with no specific background in crystallography. Moreover, the success of automated structure solutions, whose results are persistently accepted without sufficient criticism, has contributed to the spread of the pernicious impression that a specific education in crystallography is no longer necessary in order to perform crystallographic tasks on a daily basis. The result is that nowadays crystallography is increasingly perceived as a technique, if not just as a tool, rather than an interdisciplinary science strongly interacting with fundamental and applied disciplines like mathematics, chemistry, physics, material science, geosciences and biosciences. As a consequence, the time devoted to crystallographic education in undergraduate and graduate courses is continuously shrinking, and the requirement of a solid background in crystallography is disappearing from the requirements of many positions which involve a considerable amount of crystallographic work. 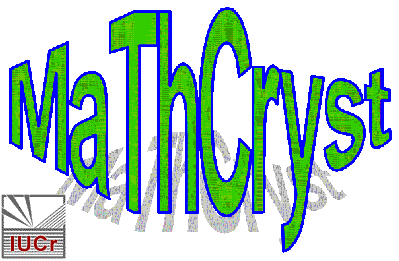 The IUCr-MaThCryst commission was started on September 2002 as an informal workgroup from a nucleus of researchers who felt the necessity of trying to reverse the current trend towards "crystallography as a black-box tool". From the didactic viewpoint, the commission aims at an activity which will hopefully cover the gap now existing between the "user" and the "specialist". This activity will develop on this web site, and with the production of printed or printable (downloadable) material.